We receive a lot of complaints and scam alerts from patients regarding some 420 evaluations online clinics and for this matter, we would like to remind you that online medical marijuana evaluations should be done by a Doctor in-person or via secured HIPAA compliant Telehealth system ! Most likely you have a fraudulent medical marijuana recommendation if you received your recommendation without being evaluated by a licensed mmj doctor in-person . You can always check any 420 evaluations clinic by visiting a medical board website by entering a Business Name. Here, at mmjdoctor.com you can get your medical marijuana evaluations online from California Licensed MMJ Doctors in minutes. Most likely, you already know that you will need a medical cannabis card before you can legally buy medical cannabis from a licensed cannabis dispensary in California. Do you know how to get a medical weed card? Do you even know why you still need it? I know, you’ve heard from your friends how great it is, but somehow the process of getting cannabis card yourself still seems difficult and confusing, maybe even tricky. And depending on who you talk to, you can have the wrong impression, but it definitely doesn’t have to be so. With the right instructions and guidelines, you can be the proud medical cannabis card owner sooner than you think and with much less hassle than you’d ever think from California Licensed Medical Marijuana Doctors. In this article, we’ll explore how to get a medical marijuana card and become a legal marijuana patient of medical cannabis in California. WARNING – MmjDoctor.com is not the same business as MmjDoctorOnline.com and 420Evaluationsonline.com. 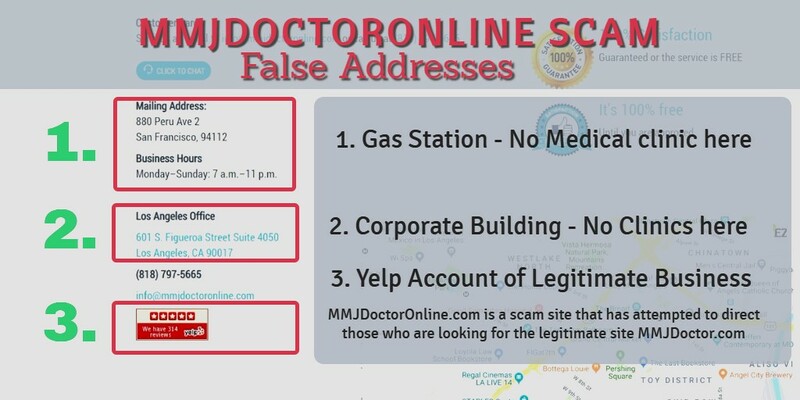 Both Services May Be Illegitimate – there is no patient-doctor interaction at mmjdoctoronline or 420evaluationsonline. In fact, it appears by all accounts to be a “pay to play” site, meaning you fill out the information, pay a fee, and are instantly approved. Anyone who wants to become a valid and legal medical weed cardholder should stay away from this fake medical marijuana card scam. California telehealth laws clearly state that a physician-patient interaction must occur for the standards of a “good-faith examination” to be met. To be seen by a California Licensed 420 doctors ONLINE please follow this link mmjdoctor.com/online. Complete the application. MMJ Doctors will contact you after they receive your online an application (11 am to 7 pm 7 days). Is It A Marijuana Recommendation Or A Medical Marijuana Card? After California legalized access to medical cannabis through Prop 215 in 1996, medical doctors have granted patients access to the cannabis plant’s healing properties by recommending it for medical use. It’s recommended not prescribed because mmj doctors aren’t legally allowed to “prescribe” medical cannabis as long as it’s illegal under federal law. But regardless if you call it a medical marijuana card, 420 licenses, prescription, cannabis card, weed card, MMID or doctor’s recommendation, what you’re really getting is a physicians’ consent and advice to use medical marijuana as a treatment for your condition or symptoms. In California, medical cannabis clubs are required to accept that 420 recommendations only in written letter format or in electronic version since 2016. That’s a full 8.5” x 11” sheet of paper complete with your name, expiration date (you must renew your medical cannabis card each year), date, patient ID #, a physicians’ signature, embossed seal and a way to certify its authenticity either by phone or online. After signing up with a cannabis dispensary for the first time. Most marijuana dispensaries will accept a digital or smaller ID card of your 420 recommendation until it expires and you need to renew it. You should be able to access medical cannabis if you think it has a chance to improve your quality of life. You can ask your primary care doctor if marijuana is right for you and to write you a recommendation letter, but most patients opt for a cannabis evaluation with a mmj professional, or “medical marijuana doctor” to get their medical cannabis card. These Marijuana Doctors can be found in cities from San Francisco to San Diego and everywhere in between, but it’s not always a nice and friendly experience to visit one. In fact, more often than not, these marijuana evaluation clinics have long wait times, are stuck in sketchy neighborhoods, often overcharging you while leaving you uninformed about how to use medical marijuana effectively. Thankfully to California Laws, we can enjoy the easiest way to be evaluated by a medical marijuana doctor and get approved for medicinal marijuana online. It’s easy, legal and safe according to the state’s telehealth laws by the medical board. Mmj Doctor is one of such clinics where you can get your medical cannabis card online. At just $69 for a cannabis recommendation that’s valid at all California medical marijuana dispensaries for 12 months, how could you not? When you choose the route most mmj patients recommend nowadays by getting your marijuana cards online, what can you expect from the mmj evaluations online process? First of all, you can sign up and complete your online medical marijuana evaluation form from any device that has internet access and a camera. You’ll be asked to fill out a standard medical form similar to any you’d find at a regular doctor’s office. You will be able to upload any medical documents, scans, MRI`s or anything you may already have. But don’t worry, your information is kept 100% private and confidential in accordance with HIPAA law and won’t be shared or found on any public database or record. Before your cannabis evaluation starts online, you will be able to choose between getting just a doctor’s recommendation letter, or a wallet-sized cannabis ID card as well, which is convenient for repeat visits to the same dispensary. Keep in mind, most online evaluation services won’t charge you unless you’re approved by the doctor; the consultation is free if you are not approved! The online marijuana visit itself often lasts just a few minutes and involves an easy video conversation about your current condition, medical history and how cannabis might help you with your condition. The physicians at Mmj Doctors are knowledgeable and friendly, making you feel at ease from the moment your online visit starts. Once your marijuana card approved, you’ll receive a digital PDF file of your mmj recommendation letter via email, which you can use the same day. Keep in mind, some medical marijuana dispensaries require the hard paper copy, so call them to find out if they accept e-version. After that, you’ll receive your medical cannabis card and an official hard copy of recommendation letter in the mail 3 – 4 business days later, which comes with an embossed seal and is signed by your California Medical Board certified doctor. Once you have your medical cannabis card, you can safely visit any marijuana clubs in California and make purchases. Medical Marijuana doctors evaluations done by California Licensed Doctors. Sign up today to get your medical cannabis card online in minutes!